Kitware offers professional support and consulting services to help you effectively leverage ParaView in your unique computing environment. We offer a range of options to best meet your needs, from basic support arrangements for answering technical questions to custom consulting agreements for more in-depth statements of work. For more information on how Kitware can help you realize your goals with ParaView or to discuss your specific needs, please send an email to kitware@kitware.com, or call us at +1 518-371-3971 (8am-4pm EST). Kitware’s support agreement provides services based on request. Our team of experts can assist you by answering email questions, scheduling periodic telephone conferences with your development team, running training webinars, or providing template project files that can help you quickly meet your goals. We bill monthly on a time-and-materials basis for services from the previous month. Use our simple form to get started, and we will send a contract for review and signature. Purchase Kitware’s support product for $2,500 with any major credit card through the company’s eStore. Redeem services within one year of purchase. For larger scale or more complex work, Kitware offers consulting agreements based on your specific statement of work. We can work with your development team to execute a tailored project, such as developing a novel ParaViewWeb-based application or implementing a ParaView-based workflow for your supercomputer. Contact us to discuss your project’s specific needs. Kitware offers customized training courses held at your site or online to provide hands-on, in-depth instruction on ParaView, focused on your specific needs. Customized courses target audiences of five or more attendees. 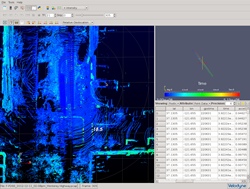 VeloView is a custom application built on ParaView to visualize and analyze point cloud data. VeloView was developed as part of a collaborative project with Velodyne.